These are all actual comments of Arizona Classics customers. Although some of them sound embellished, they are in fact, actual unedited comments received by Arizona Classics. Bob Spitler picking up his 2003 50th Anniversary Edition Corvette. Bob had this to say " Frank, Thank you again for the great job you did on the Vette. (Talking about the pre-delivery detail) I know you went over and above on this car. This is my 10th Corvette and could just be my best one. I had been wanting to buy a proper "affordable" sports car for a long time but I just couldn't put my finger on one. Out of the blue, I remembered the S2000 and started looking around for one for a cheap price. I knew that I'll have to buy one in an abused condition and will sell it after a few months to buy a newer car. This was only until I saw Frank's ad online. This was little expensive that others online but a near mint S2000 ap1 with 30k miles on it being bone stock. I saw this online on Thursday night, went there Friday afternoon, saw it, drove it and booked in one hour. Dealing with Frank and buying such cars have their own excitement that a heartless dealer can never provide. Just after I paid the deposit we sat for hours discussing the all the great cars in our opinion, Frank's racing anecdotes, his scrap full of cars he has owned and the races he has been in.He suggested near by mountain roads I could drive on. Most dealers want you out of their office after you've paid the money. I have taken this to the local S2000 owner's meeting here in the Phoenix area and it has stunned every person till now. They are surprised to find an S2000 ap1 in such a condition. Frank, thanks a bunch for this experience. I'll stop by one of these days with some beer and we'll go over your scrapbook in detail.It'd be great if you can email me the pictures you had clicked. Quick tip: If you're buying a performance car from him, ask him to test drive it for you. You will take a lot of years to even begin to learn the way he drives performance cars. able to afford. Finally, you posted a Dodge Ram 2500 on your web site and I just had to have it! everything else on the market. research and print out a brochure for the exhaust brake that was installed by the last owner. offers that level of care and attention to their customers' needs? faster car buying experience, and I have certainly never had one that was more fun! I just wanted to take a moment to thank you for my recent vehicle purchase. to use your services again in the future. not typical dealer fashion. Why? up and no pressure - none. purchased and it was/is in great condition. vehicle, I plan to tap Frank to let him know what I want. "Doing business with Frank Benefiel of Arizona Classics was a total pleasure. Frank is a man of integrity and does what he says he will do. 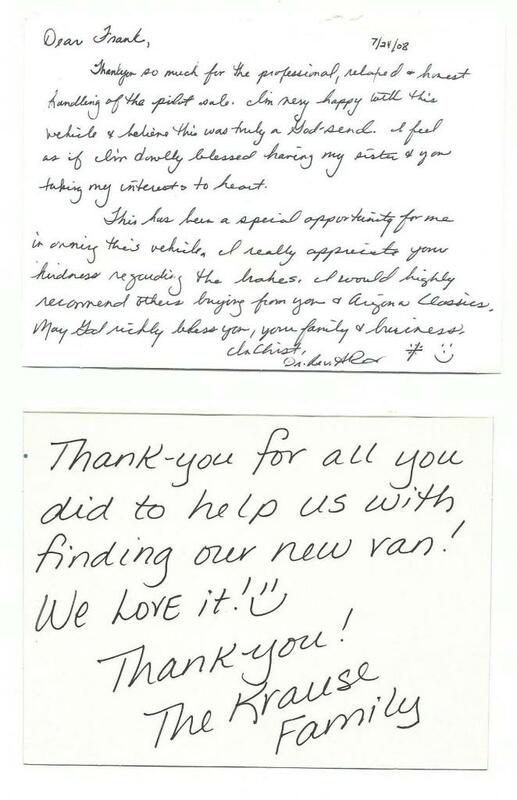 My vehicle purchase was clean and fair...."
one of our favorite special places to eat. Thank you, for sending along the links to your 'photo bucket and Facebook' albums enjoyed them all. I have some pictures to send you about 4 in total--thought I'd attach a special one fore you now. anyone that might be interested in a used or classic car. PS: We love the car! meeting you as well and seeing all your lovely cars. Sorry I didn't get to respond sooner. This is my first day off. buy another car from you. or rattle anywhere. I checked the highway MPG recently. two malls in Flagstaff and home to Winslow. 29.4 MPG I was stunned. a garage even when I move. Good morning, Frank. Everything went very well and we love the vehicle. I mailed the paperwork back to you last Thursday. things settle out on the work front. We made safely back to Colorado. The Honda Pilot drives like a dream. a car purchase. NOT EVER! lives car buying was a real pleasure and not another stressful hassle. We wish you much success and good fortune! but I just got the title for the jeep on Thursday of this week. I got the chance. Everything went well, I got a S.Car. title. honesty. You made me feel so comfortable about the deal. (I know there's a lot of them out there) I'll holler at you. Arizona Classics | Classic Cars in Tempe and Phoenix AZ has been visited 4,563,517 total times.